A VantageScore is a consumer credit score that is a competitor to FICO. It is used by lenders, landlords and credit card issuers. A VantageScore is a credit score jointly developed by the three major credit bureaus to predict how likely you are to repay borrowed money. It is used by lenders, landlords and financial institutions to evaluate creditworthiness. Credit bureaus Experian, TransUnion and Equifax came up with the algorithm to produce VantageScore in 2006, competing against the better-known FICO scores. Initially, VantageScore was on a different scale than FICO, but the most recent revisions have a 300 to 850 scale, just like FICO’s. VantageScore has begun to get lenders’ attention, and it is widely offered to consumers for free. About 6 billion VantageScores were used by lenders in 2017, according to research firm Oliver Wyman. More than 1 billion went directly to consumers. 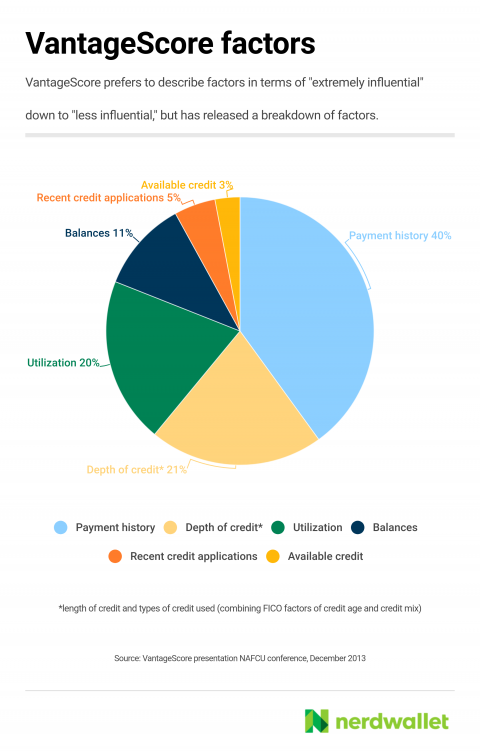 VantageScore prefers not to use percentages to describe how much weight it gives various credit factors, as FICO does, but instead describes them in terms of influence. Still, the factors that matter most in FICO scores are also the most heavily weighted for VantageScores. For both, the single most important thing consumers can do to help their scores is to pay on time. VantageScores are on a range of 300 to 850, which is the same range as a typical FICO. A score closer to the maximum 850 means better credit. The proprietary VantageScore formula is applied to the data in your credit reports. Often the credit bureaus have slightly a different mix of data because not every creditor reports activity to all three, so your score may vary for each bureau. A score closer to the maximum 850 means better credit. VantageScore has announced a 4.0 version, and it is being tested by credit bureaus, according to spokesman Jeff Richardson. It will treat medical debt in collections more leniently than the 3.0 version does. It also will update how data is approached, paying attention to how credit factors are trending (getting better or getting worse). You can get a free VantageScore from NerdWallet and from some other personal finance sites. NerdWallet’s scores update every seven days and include a free credit report summary from TransUnion. VantageScore also maintains a list of free credit score providers, along with information on which credit bureau’s score is offered and how often it updates. It can take less time to establish a VantageScore than a FICO score. VantageScore can produce a score with just a month or two of a consumer opening a credit account. FICO scores require six months of credit history. Another difference is that some consumers who can’t be scored by most FICO models because of a limited credit history can still get a VantageScore. That’s because VantageScore takes into consideration recurring payments such as utilities, rent and phone bills. If you are looking to track your score over time for credit-building purposes, a VantageScore will do the job as well as a FICO. The same behaviors influence them both. If you are looking to track your score over time for credit-building purposes, a VantageScore will do the job as well as a FICO. The strategy for achieving a good score remains the same: pay bills on time and keep balances low. Conversely, paying late or using too much of your credit limit lowers your score.